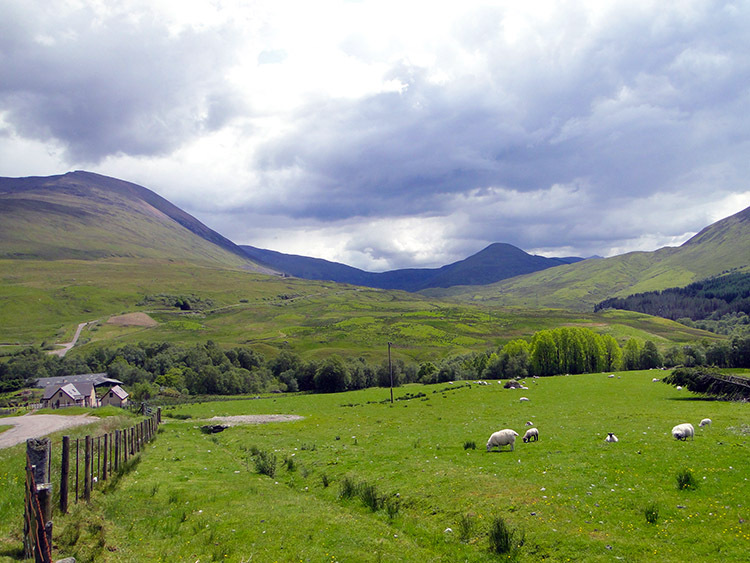 This was my first stage of the West Highland Way which I had thoroughly been looking forward to. It was also the 19th stage of my Great British Walk. The previous stage had been three days ago as I had completed the Cape Wrath Trail by hobbling in severe discomfort into Fort William. 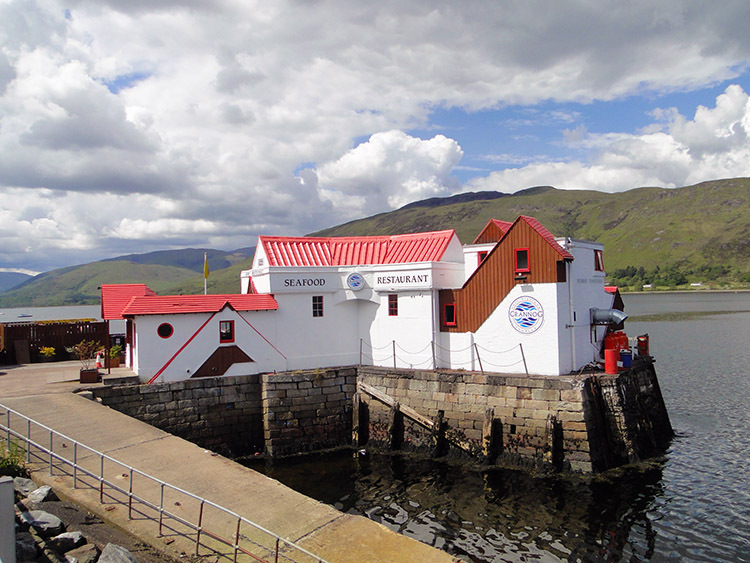 For the next two days I was confined to bed in my accommodation resting my right heel which was agony to stand on due to the impact damage I had suffered on the Cape Wrath Trail. Fortunately my wife Lil had joined me in Fort William to lend support for the duration of the West Highland Way stages of my longer walk. Therefore I could walk without the strain of carrying my backpack, bedding, equipment and tent. Still I felt unsure of how I would get on walking this first stage of my West Highland Way. I was now two days behind schedule and grateful for Lil's arrival in Fort William. Her support and encouragement was much needed and vital to get me back on track. We were staying in Tarbet beside Loch Lomond for the next three days as my original plan had me in Tyndrum by now thus making logistics much simpler than they now were. By still being in Fort William the driving Lil had to do up and down the Pass of Glencoe to support me was an extra burden she bore with fortitude. I was and remain immensely grateful for that. Lil had encouraged me to take the first tentative steps by going round the walking and hiking shops in Fort William to get some foot support pads and walking poles. I had never used either before by being too stubborn to recognise their merits. Now I was forced to use both. With no backpack to carry, heel supports in both boots and my new walking poles in both hands I set off walking. I strode out very tentatively along the path from where I had stopped at the end of the Cape Wrath Trail two days earlier and on to the footpath by the A82 and alongside Loch Linnhe to a roundabout where I left the A82 and started climbing through the suburbs of Fort William on the Old Military Road towards Upper Auchintore. The first steps had been slow, well determined and thought out as I tried to understand where the painful areas of my heels were but as I started climbing, albeit with a pronounced limp, I gained momentum. I started to believe in myself with every step I took out of town. When setting off from Fort William the simple plan had been to see how far I could go. Lil had urged me on by saying "Try a couple of miles and we will see". She knew I would be demoralised by hanging about in Fort William any further and she was right. By walking I was hoping again. "I can do this" I thought to myself as the pace increased while I climbed the 100 metres which took me through Upper Auchintore and past the last house on the road to a viewpoint from where I caught sight of Ben Nevis. 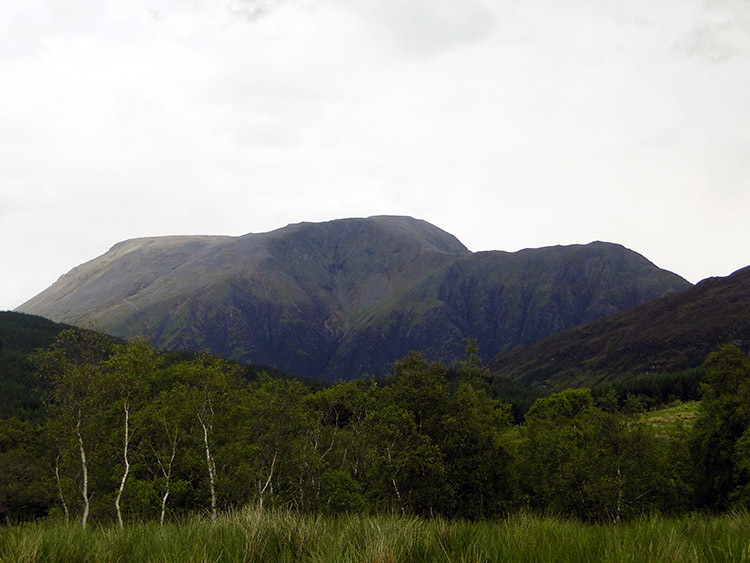 The view to Ben Nevis was fantastic in two respects. First because the weather was so good and visibility excellent. 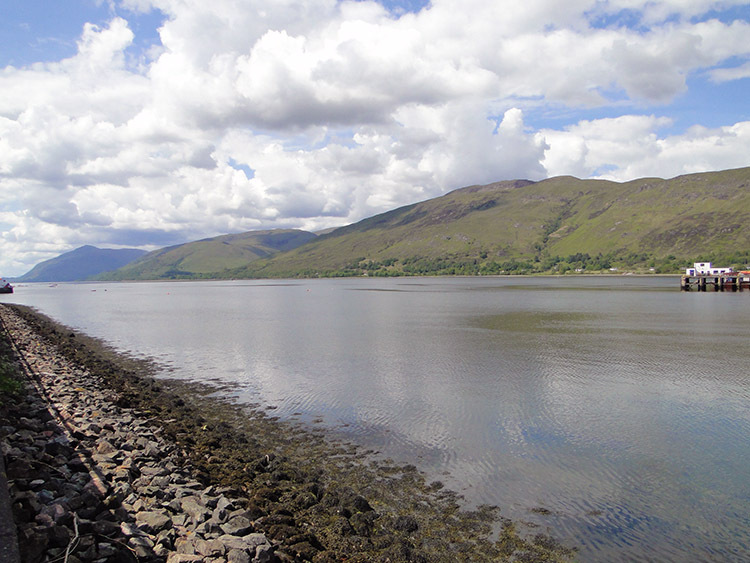 Second was the whole sweeping panorama to Fort William, Loch Linnhe and the impressive range of hills rising above Loch Linnhe's north west shoreline, a panorama that along with my improving confidence in being able to walk at all heartened me tremendously. With Lil keeping me close in sight, following behind in the car and providing drinks when I needed them I pressed on. My next target was Glengour, a point on the map which was also the landmark of 2 miles, the distance which Lil and I had agreed I should try and walk. 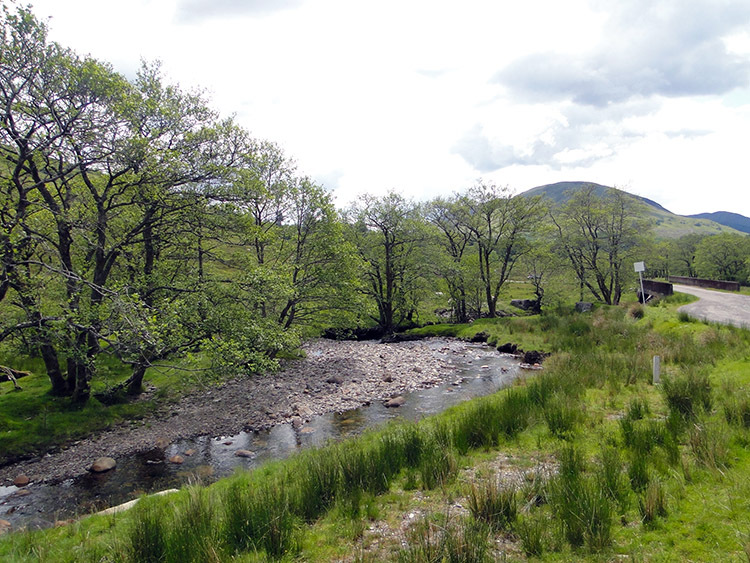 At Glengour I reached a road bridge crossing the Abhainn Bheag. Here I stepped off the road, walked to the stream and stood in the shallows to submerge my boots to the heel and cool my feet. It was a hot sunny day, the cooling was an indulgence rather than a relief, a precaution to allay a risk of overheating my recovering heels and soles of my feet. I felt good on doing so and resolved to try another mile or so to Blarmachfoldach. I continued to walk steadily and with growing confidence along the quiet old military road. As I walked along I was passed by four cyclists but not before they had all hailed me a good day and I had returned the compliment. The road was undulating, up and down, up and down, from Glencour to Blarmachfoldach and I watched the cyclists ahead of me dismounting on the short steep uphills to walk rather than ride. Their activity and the views unfolding to the east and west occupied my time nicely until I reached Blarmachfoldach where I was enraptured by the view to Ben Nevis. 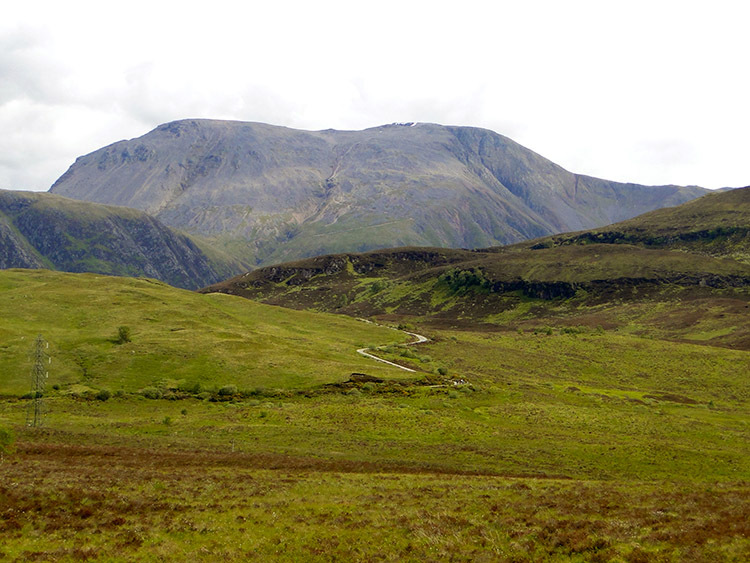 It was to be my last sight of Britain's highest mountain on the walk before it became hidden behind Mullach an Coirean but what a marvellous sight it was. Stunning. 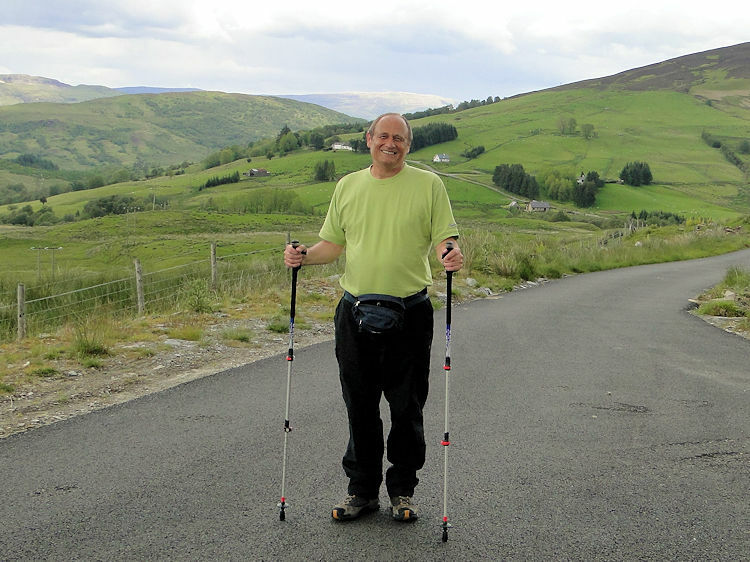 With my new walking poles doing a tremendous job in supporting the load on my feet and no weight to carry I felt able to continue walking on from Blarmachfoldach. I had done almost four miles and though I was tiring as each step had to be carefully taken, all accompanied by a pronounced limp caused by the injury, I felt I had a little more in me. Looking at the map I knew I would have to stop soon anyway as the car friendly part of the road would soon run out and Lil would no longer be able to provide reassuring support. So I looked at the map and determined to get to Lochan Lunn Da-Bhra where the road ended. Thus I walked on and though physically tiring I steadily made progress along the road to the ruins of a building at Blar a Chaorainn. 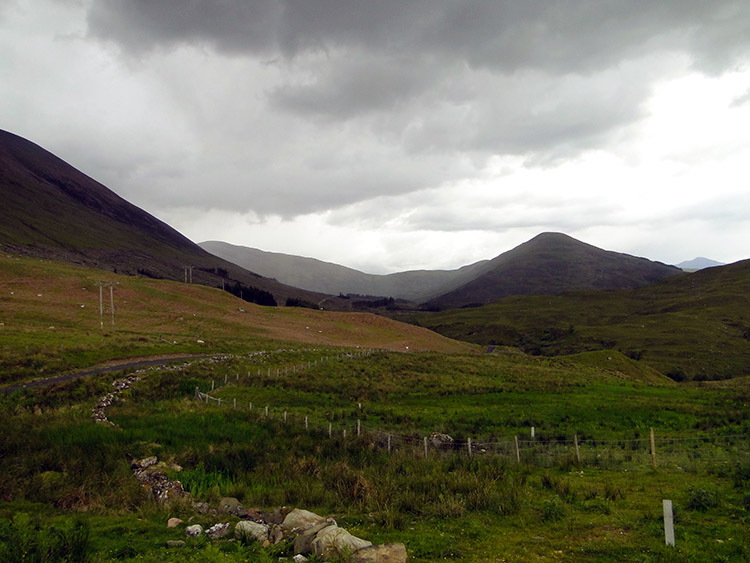 Here I had reached the official West Highland Way route, the tarmac road ended and my days terminus had arrived. I had done 5.3 miles and I was elated. However, I realised I was now three days behind schedule and some serious catching up had to be done. The question was 'would my feet take the strain? '.